Artist Steve Hopkins—aka Hoppy—handcrafts all of this copper garden art. 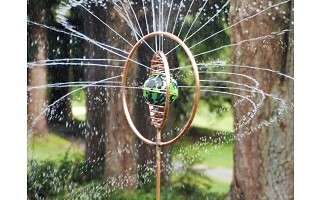 He was working on a copper trellis for a client who suggested making a sprinkler; Steve switched artistic gears to this functional (and fun) sculptural piece that spins, sprays, and shines in outdoor spaces. 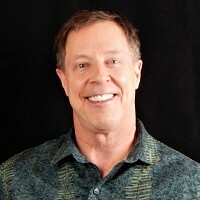 Watch one of Steve’s sprinklers in action and you’ll appreciate the craftsmanship he puts into it. He builds each one with polished copper hoops and a blown glass orb that won’t fade over time. He balances it to ensure it will spin perfectly, too. It’s a statement piece that measures up at four feet tall and is as much about creating whimsy in the garden as it is about actually, you know, watering the garden. 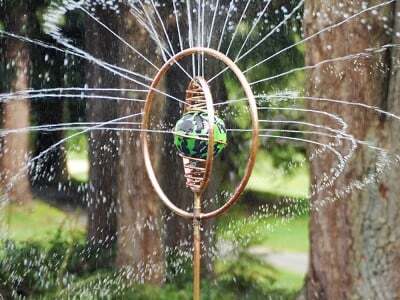 Stake it into the ground, attach it to the hose, and let the sprinkler do it’s mesmerizing, spinning thing. What is the spray diameter of the sprinkler? The spray diameter ranges from 12 to 30 feet. What water pressure is required to spin the sprinkler? A sufficient water pressure of 50 PSI is needed to spin the sprinkler. Can you store the sprinklers outside? Yes. Please note that they will age and patina if stored outside. If you want to prevent the copper from developing a patina, you can polish it and put a clear coat of spray acrylic that should last for years.